The following is a post by Jamerrill Stewart of FreeHomeschoolDeals.com. In more than ten years of homeschooling, I have yet to hit a season in which I don’t have a baby, a toddler, a baby and two toddlers, along with older children, or some non-matching age-range combination. First let me encourage you, we’ve survived and you will too. If you’re worried that somehow your older children are being harmed because, as Momma, you are juggling multiple ages and stages, let me calm your fears with this: we’re still here.My older kids are fine. My middle kiddos are fine. My preschooler, toddler, and baby — all okay. And me as Momma? I’m still here and wouldn’t have it any other way. And in all honesty, none of us would trade these babes, even after they’ve been discovered to have painted their arms with blue-man-group paint (true story! ), or wish away these years. There’s a certain level of surrender that we have to go through. A little more dying-to-self that motherhood slowly imposes each day. You have to lean into it. And the “blender days” of homeschooling with little ones underfoot are no different. As long as there is not a major snow or rain storm, one of the first orders of business in our homeschool life schedule is to get outside. During decent weather we can end up spending up to 2 hours outside playing in the mornings before the school books hit the table. Even in lousy weather we’ll bundle up and get outside for a good 30 minutes. We are all better for it. 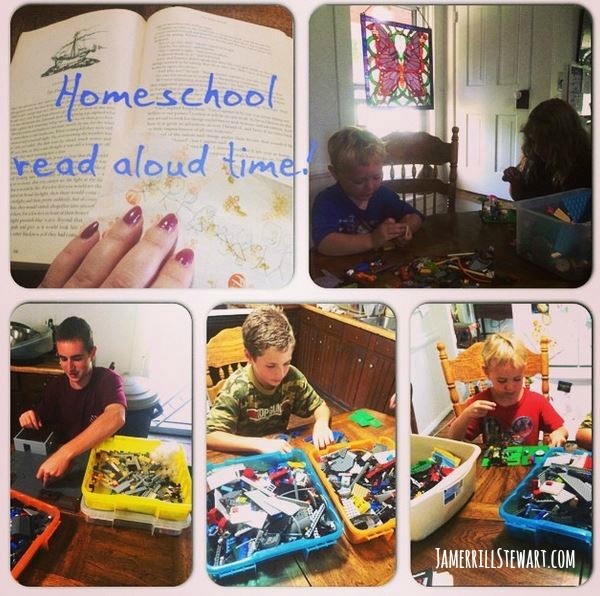 In our homeschool the little ones get to “do school” with the family. Much like a one-room school house, I focus my attention on our 2nd-grader, kindergartner, preschooler, and toddler at our big table first. Our older children, who are upper elementary/middle school and high school levels, spread out on the couches with their books and independent work during this time. I find that after we start our day with fresh air and outside time, the little ones are ready for a natural time of sitting down as a family at the big kitchen table. I don’t make how long they stay seated a big deal. My 19-month-old very well may sit and “draw” (she repeats the words, “draw! draw!” excitedly when she sees the school boxes come out) for up to 20 minutes. Usually, once she’s done with her drawing, it’s time for her to go down for her nap. The preschooler (3 1/2) and kindergartner (5) have workbooks from the dollar store and naturally are eager to work on writing their numbers, letters and names. I let them work as long as they’re interested, and then they’re free to choose from simple activities listed below. During our early years of homeschooling I have simple activities saved for school time. The kids are always free to pull out the bag of big wooden blocks or duplo-style blocks. I have a crate for each little child with their own selection of puzzles, books, basic craft supplies, and an inexpensive dry-erase board. If you give a 3-year-old a glue stick, stickers, 2 crayons, and a file folder, most will be engaged for quite a while. Here are more than 134 Preschool Activity Ideas for Homeschooling Little Ones. Once the little ones have moved onto their simple activities of choice, I’m able to help older children with their work as needed. Then as a family we roll into read-aloud time. At this point, read-aloud time includes all the children except the 19-month-old who is still napping. The little ones usually continue with their simple activities, or do Lego creations with the older children while I read. *If you have children who are struggling, plus younger children, you can exercise your homeschooling freedom and flexibility by creatively working on areas of difficulty during nap-time or even in the evening. I had a season when I “only” had a 6-year-old, a busy 3-year-old, and a newborn. My 6-year-old and I worked on his math and phonics in the evenings when the house was quieter. This is truth right here. No perfect. This is real life. 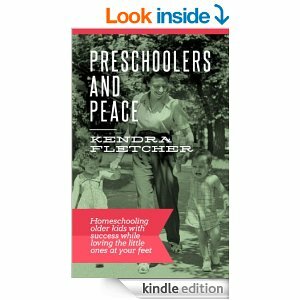 You can see Pinterest-perfect pictures of homeschool rooms and read articles on complicated toddler and preschool homeschooling systems that can quickly make a homeschool mom feel bogged down. If you WANT to do colored rice bins, then go for it. If it adds too much pressure to what you’re already juggling, then free yourself and know that the little ones will be just as happy with something that is simple for you to pull together in your world. No matter what, your life will not be perfect, flawless, or smooth. But you’re alive. You are living each messy and joy-filled day with your children. You are fully living. 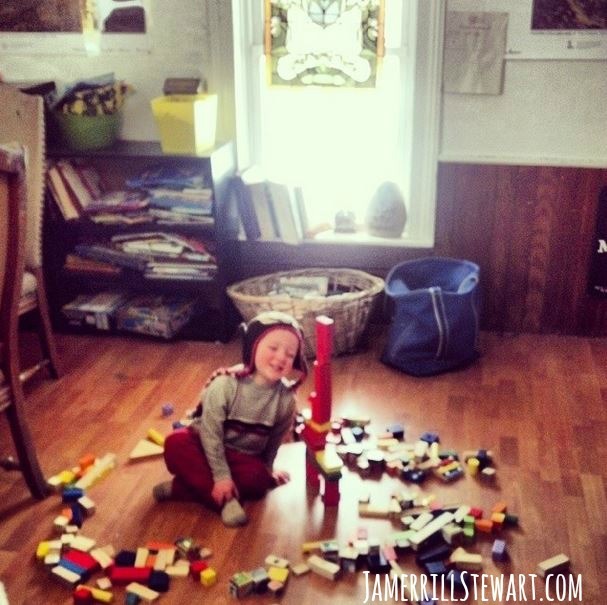 5 Tips to Occupy Your Toddler While Homeschooling – yes, please! 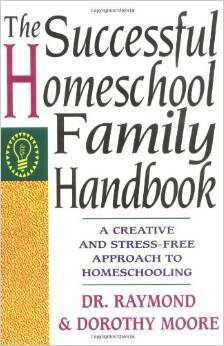 What are your questions or tips on homeschooling with little ones? 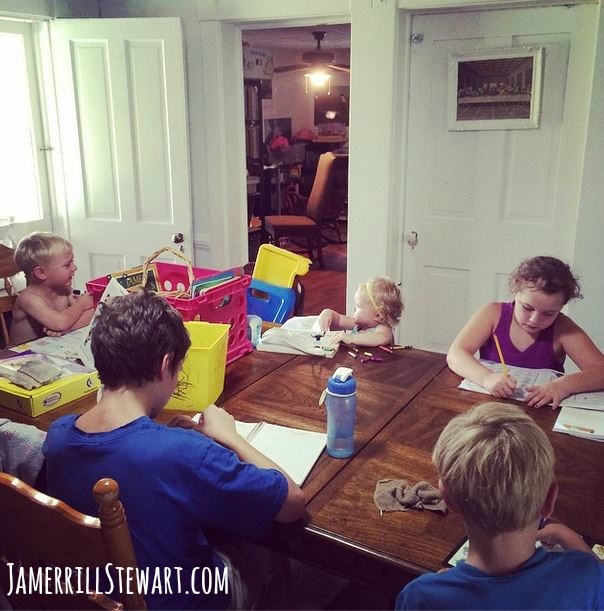 Jamerrill Stewart is a Christian homeschooling mom of 6 (soon to be 7) and wife to her husband Travis of over 16-years. They enjoy their country days catching frogs at their pond, getting lost in great read alouds, and spinning on the tire swing. Jamerrill created FreeHomeschoolDeals.com in 2012 to help all families in affording the homeschool life. You'll also find her sharing about Jesus, Motherhood, Homeschooling, and other stuff at JamerrillStewart.com and JamerrillStewart.TV. This is perfect timing for me. We just started doing slightly more formal school with my preschooler because she was begging for it. My 16 month old thinks this is a drag. 🙂 Great tips. Looking forward to checking out the other articles as well! So glad you found it helpful, Steph! I love this post! Especially the blender with no lid comparison- so true! I have so many (non-homeschooling) friends ask, “how do you homeschool with a two year old around?” And I find it almost a non issue. I find simple things to keep him busy while I work with the older kids, just as I would if they were in school and I needed to get some housework done. Young children tend to just go along with the family routine, whether that is homeschooling or running errands or taking older kids to sports practices. As long as you give them attention and time to play/rest/eat, they are happy to be part of the family! Haha that’s great for you, but some 2yos (or nearly 2, as is the case here) are not as….pliable, shall we say? Regardless of activities offered, school time becomes a screech-fest for my toddler because she is not getting 100% of my attention . The older two can’t concentrate, I can’t concentrate, and it’s frustrating to everyone involved (except my 3yo, who takes advantage of the chaos to get herself into trouble). Definitely not a non-issue. I think you lucked out with the temperament of this child. I felt the same way when my second was a toddler and we started schooling the oldest. She was so happy to do the activities I gave her and would sit quietly as long as I needed her to. I thought I was the master of this homeschooling thing. Then my third came along. And my fourth. Totally different temperaments, totally different experience….and most definitely an actual issue. This! I have 4 kids and my 2 and 3 year olds hate it when they don’t have my attention, unless the tv is on, but then my 6 year old can’t concentrate. I just find little moments in the day to work with her. Nap time is one of them. My kids spend hours outside on a normal day, but it’s usually as a reward/break after finishing part of their school. I love the idea of getting outside at the very beginning of the day to clear their (and my!) minds and get the day off to a happy start. Thanks for the fun peek into your day. Well, I know I’m going to be in the minority here, but my 3 year old goes to mother’s day out/”preschool” two mornings a week. It’s fun for her and gives me a little time to do more uninterrupted school with my 8 year old. In no way do I think preschool is necessary, or for every family, but this part time option works for us – it’s truly more about a break for me than something I think she “needs”. 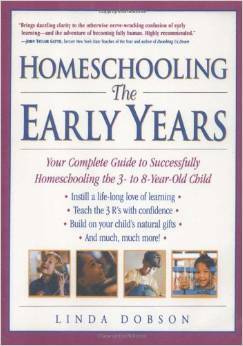 I bring this up because I it seems like preschool gets a bad rap in homeschooling circles, and for a while I felt guilty because homeschooling means every single one of my kids with me every single minute of the day – right?? I’ve come to believe that it’s okay to give myself a break. To tell the truth, I’d send my older child to a 2-3 half day/week program too if such a thing existed where I live. I do appreciate these tips, though, because my toddler is with me more often than not and I’m having a baby next month, so I expect the chaos level to increase shortly! I think that is an excellent idea, if it is financially an option. Many churches provide these and they are of excellent quality. I know someone who did this instead of enrolling her “big” kids in Christian School, which was way more expensive. Also, the older childrens classmates may be exposed to a more “cultural” (for lack of a better word) environment than your chidren s/a (language, music, etc.) at home and you really have no control over whether they share that w/your child. I have a “blender with no lid” in my house right now! LOL! Light bulb! Outside first…that is brilliant. I have always started with math right after breakfast and morning chores, but then everyone is itching for attention and it is still almost 10 before we get rolling. Looking forward to trying this on Monday! Sarah same exact scenario for me!! It’s so encouraging to know I am not alone. 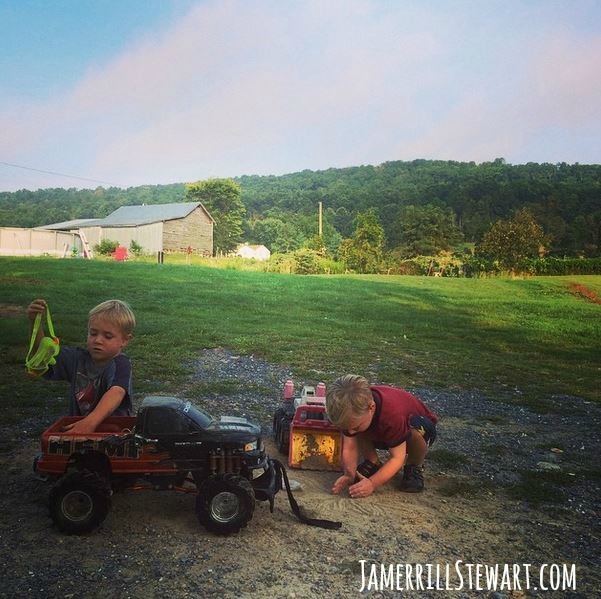 This is such a great post… I love the get outdoors and play first. 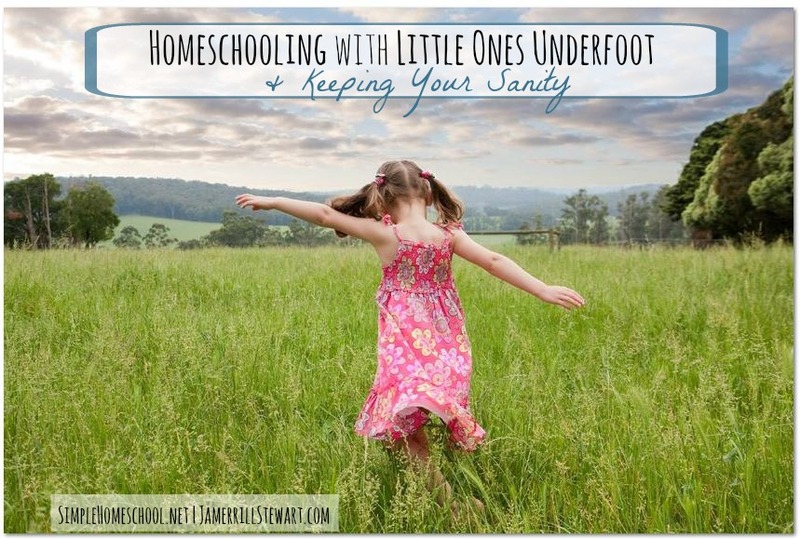 We have never homeschooled without “toddlers underfoot” and to be honest I have never thought of them as “underfoot.” The little people in our homeschool are as much a part of it as the older kids in so much as learning is a lifestyle and of us all, at any-one-time they are probably learning the most. With a lifestyle of learning we have never needed to do something special with the little ones because they just tag along and do whatever everyone is doing… they do art alongside the older kids and draw and “write” and listen to stories… they explore the great outdoors and find fascinating things for the nature table – it really is about family schooling together… my kids know no other way… certainly my older kids wouldn’t dream of the little one’s being in another room while they did school – they would be appalled not to have the youngsters alongside of them!!! Ahhh…your words are like music to this tired and stressed out mama’s ears! I have a 9 year old girl, 5 year old (super active boy), the most adorable yet most destructive “blender without a lid” I’ve ever seen, and a baby on the way! I love your advice to just “lean into it.” I have been trying to fight it and figure out for so long, and am finally figuring out that everything doesn’t have to be perfect, or fit everyone else’s homeschool mold, but that we can just do what works best for us and embrace the messiness of it all! Thanks so much for the encouragement! Moms and Dads of large broods….are the luckiest people on this planet! Jamerrill, your words are always so encouraging and I am so thankful that you have been given this gift to share with those mommas in need! I am certainly one of them and you have been encouraging my family even as we were trying to decide if homeschool was right for us. Thank you! We do a lot of what you talk about in this article. My 3 year old boy loves to “do” school with his big sister who is 6. He will do dollar store workbooks and then I have “quiet” activities that he can do if he gets tired of the workbooks. He enjoys this because I keep some of the school time toys put away and they are special treat for when we do school. We are still working on the “quiet” part as he thinks that all toys should make car or airplane noises or be banged like drums. Do you have any ideas for encouraging quieter play in boys who just like to make noise? Jamerill, thank you for this article. I’m homeschooling my four kids (9,7,4,2) and to be honest at this very moment I’m having doubts about keeping my sanity while doing this. Can you pls elaborate on “leaning into it”? I would greatly appreciate your help. My sister wants to do school with me and this gave us an idea. I am in grade 4 and I love having my little sister join class with me. i would love your help! My 6 year old (doing his 2nd year of K) is PDD-NOS and hates school. Hates to color, write, everything. My 4 year old son is obsessed with anything learning and is so smart. My 2 year old son is on the same path as my 4 year old except he is 2, and he is very rebellious when i take the lead in anything over 5 seconds. I am happy with my 6 year old in school for now, he has speech, ot, pt and i feel he needs it… but i want to get into something with the other 2 younger ones. I would LOVE to home school, i work from home during the days with my husband, and the 2 year old takes a 2 hour nap everyday. I know this is a lot but any recommendations? any help you can give and ideas would be amazing. While i love pinterest i am no way mom of the century, and i dont have reading nooks and hammocks for them to learn in lol. Please feel free to email me, i would LOVE IT! This really encouraged me today. Thank you for sharing! Thank you so much for this. I have a 6yo (soon to be 7yo), a 4yo and an 11mo. The 11mo is on the cusp of toddlerhood and already gets into everything (she is the sweetest little busy bee!). I’ve been pulling my hair out trying to figure out a school routine for us that works! My 6yo is smart as a whip but very distractible, so trying to knock out math and language arts when then baby is roaming around and my chatty 4yo is wanting conversation is NOT working. This morning I tried getting everyone outside for playtime and that has really helped the focus issues. I’m going to try getting the baby up at 6:15 with the big kids (I’m up at 5 myself) so she will go down for nap at a reasonable time where we can start our workbook work. That outside time seems to make a big difference though! I think this is great! I love your paragraph about how there is no perfect. That’s such reality! Every day is different, and brings new and different challenges. Something I’ve done at home with my own little one is to set up Learning Centers – interest areas devoted to a specific type of activity or play. A little bit like your bins for each of your little ones, but a more permanent fixture in the home. That helps to keep little people busy so that I can focus on other tasks in the home. Thanks for an excellent article. I love a lot of the ideas in here! How much more dying to self can I do?!? Why can’t my husband see that he has to do the same thing?!? 200%. My husband has days off from work but I never do. Even on vacation I’m doing the exact same thing, only in a new location. I’ve a 15month old that climbs everything. Her favorite thing is to climb to the top of the couch and jump off. I’m “working” from 7:00AM to 11:00PM 7 days/week. I can’t die to self anymore. Oh! And the baby is asleep by 6:45PM, the 9yr Old by 7:45PM. The 8:00-11;00PM is laundry & meal prep, lesson plans & housecleaning & mowing the lawn it goes on & on. Yes, I mow it at night Bc it’s 106*F in the daylight. Oh, throw in teething & that’ll bring a few night time nursing sessions. I’m glad it works for the author & I like her suggestions but with some families, it’s not as easy as she makes it sound. I can’t lean in any more or die to self anymore. I don’t even like the weekends just getting to church is more of a hassle . This is such encouraging and wonderful information. Thank you for sharing your knowledge.